Last weekend we had some amazing deep dish pizza in Chicago and I got to thinking about the many pizzas I've enjoyed around the world. It seems anytime I'm in a place for more than just a few days I end up eating pizza. Normally you think of cities like Chicago, New York and even Rome for some great, signature pizza, but one of my favorites was in Boston. I love when I can associate a great food experience with a great vacation memory, and this is one of those. On our first night in the city, we were all pretty tired from our travels to get there. We wanted dinner someplace casual, comfortable and not far from our HomeAway rental property in Jamaica Plain. 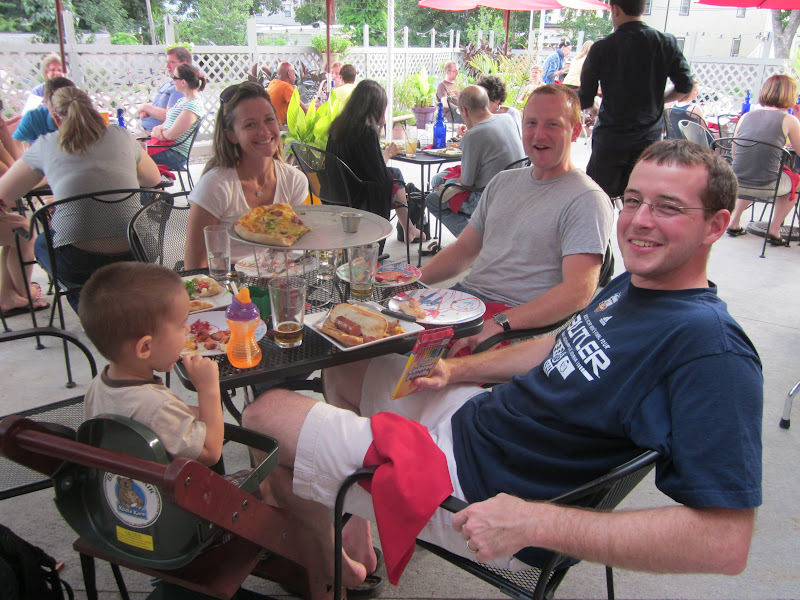 The homeowners we rented from recommended Bella Luna, a restaurant near the Sam Adams Brewery. This is a place where you'll find what I call "fancy" pizzas. Not the greasy, cheesy slices you might normally order (but make no mistake, I'm a huge fan of those as well). Interesting toppings and unique flavor combinations are the rule at Bella Luna. We did a mix of light and heavy. The Lover's Lane was sort of like a delicious salad on top of your pizza. 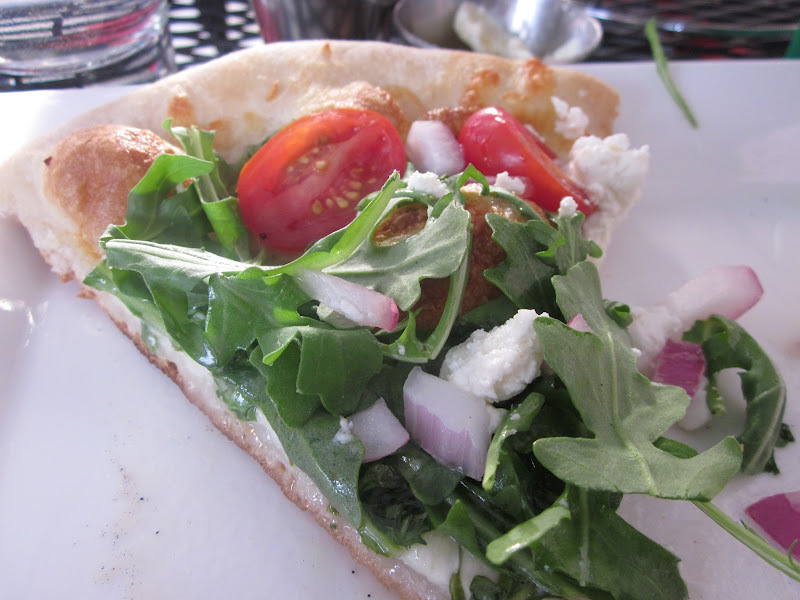 Arugula, red onion, tomatoes, and my personal favorite, goat cheese. Very flavorful. And I can't remember what this bad boy was called, since I no longer see it on the menu (note to self: maybe you should write about restaurants within six months of eating there). 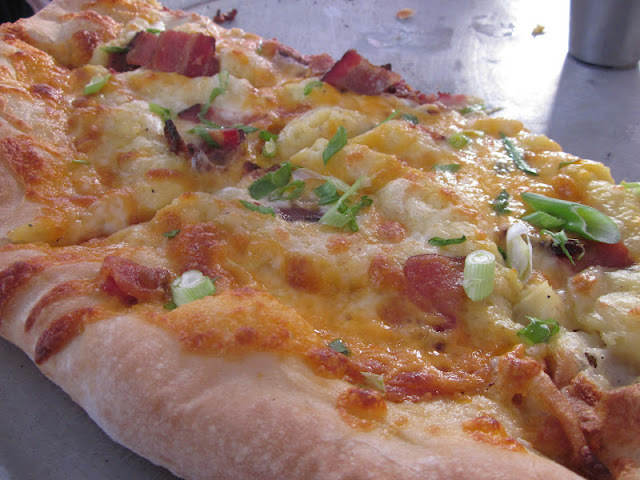 But it had ricotta cheese and bacon. Needless to say, it was our "heavy" pizza, emphasis on delicious. But my favorite part of dining at Bella Luna was the company and the atmosphere. Some of my favorite people on a warm summer evening, kick starting a great vacation. So while I may forget what we ordered, I won't soon forget the memory of eating there. Don't you just want to pull up a chair, order a cold beer, and join us? Big Arrow would probably color you a picture. Read our Boston Trip Report for more information on our time in this great city. Check out what other food-loving travelers are dishing up at Wanderfood Wednesday at Wanderlust & Lipstick. Yum! For your next trip to Bloomington, visit Finch's and get the Dordogne. To quote Neil, "This is so good, I wish I could kiss my own lips." That doesn't look like any pizza I've ever seen! But it does look delicious! Can't wait to hear more about your pizza adventures.